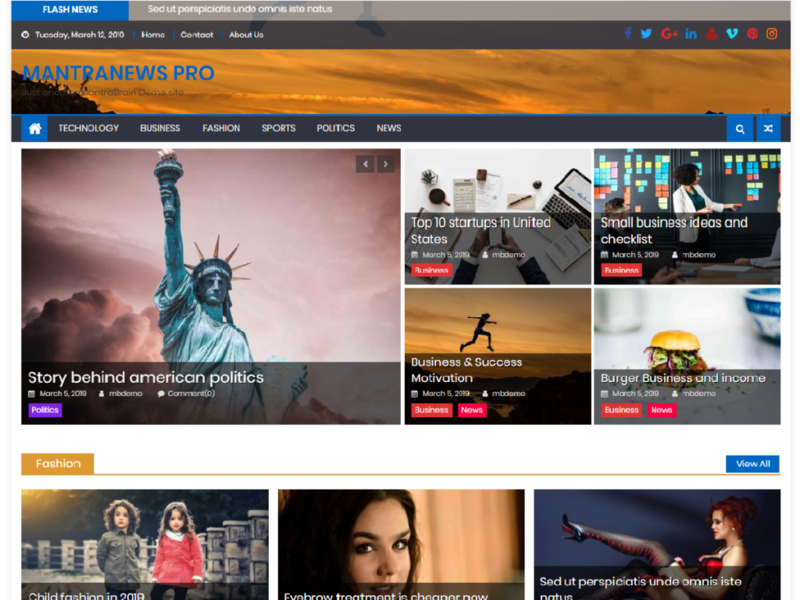 Mantranews Pro WordPress theme is Premium version of mantranews WordPress magazine style WordPress theme. This theme is mainly applicable for news portal, personal blogs, creative blog, publishing house and any kind of informative websites. Our all products are translation ready. You can use all of products in your native language. You can get an awesome feature slider widget. There are many option and layouts on the slider. You can show post carousel using carousel widget. It is simple, clean and a lot of options. You will get home page template to design the home page. You can make a beautiful website using this template. Other options are also available for home page section of this theme. You can get a lot of options on header of this theme. Like sticky header, color customization , social media links. Datetime options and top header navigation and lot more other options are available in this beautiful theme. There are different widget areas on the theme. You can customize those widgets areas too. You will get color options on footer area too. You can choose number of widgets section up to 4 on footer section of website.